In the high-stakes world of restaurant poker, the sturdy comforts of a good Italian feed are a safe bet, the culinary equivalent of putting your money in savings bonds, or placing $2 on the favorite to show at Belmont for nine races in a row. Which may explain why, in this time of general economic distress, new Italian-influenced joints keep popping up around town like winter mushrooms. Not so long ago, the basement of the Hotel Giraffe on lower Park Avenue was occupied by a hipster French-Chinese fusion joint called Chinoiserie. Now it’s home to Sciuscià, an “eclectic Mediterranean” restaurant where the specialties are various elegant varieties of pasta, along with meat loaf-albeit one cooked Neapolitan-style, with a boiled egg inside and a smothering of rich tomato sauce. Sciuscià is Sicilian slang for “shoeshine,” and also a reference to a somewhat obscure, though presumably brilliant, Italian film of the same name. 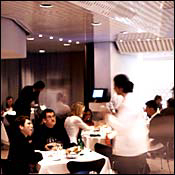 The restaurant’s culinary and aesthetic references, as conceived by Gianfranco Sorrentino (owner of the fine midtown restaurant Il Gattopardo), are, if anything, even more ambiguous. The room’s interior has been sheathed in white metal paneling and looks spare and perhaps too clean, like the first-class lounge of some upscale Icelandic airline. There is nothing spare about the menu, however. It contains serviceable renditions of earthy delicacies from all over the Mediterranean map, like grilled rack of Moroccan lamb (very good), oily rashers of chorizo laid over garlic potatoes (quite good), even ground-lamb kibbeh, shaped like little doughnut holes and served with a minty yogurt sauce (predictably fine). But in its heart, Sciuscià is mostly an Italian joint, and not a bad one at that. My friend the Italian snob turned up her nose at a deflated mound of zeppole made with ricotta cheese and served as an appetizer, but was effusive in her praise of the house pastas, particularly a bowl of flat, steamy paccheri, which is a kind of giant rigatoni, larded with a chunky tomato sauce and nuggets of buffalo ricotta. The risottos change daily, and the one I sampled was well made and tastefully dotted with bits of fresh zucchini and shrimp. The Neapolitan meat loaf was as comforting as a dish like that can be when served in the bowels of an antiseptically trendy Manhattan hotel, and so was the roast chicken, which was cooked in rosemary and garlic and contained satisfying deposits of lemon zest hidden under its crispy skin. As befits a restaurant devoted to Mediterranean themes (and one with an Icelandic visual motif), the fish at Sciuscià is also generally superior. Cod brandade, a dish that can have all sorts of creepy variations in Manhattan, was properly leavened with olive oil and whipped potatoes, and served with a basket of warm pita bread for dipping. My turbot was dripped in a black-olive tapenade and cut in long tender slivers, and the flavorful orata was cooked with its head on, in the classic style, in a steamy parchment filled with fresh tomatoes. The loup de mer had a dense, almost unfishy quality (it’s packed in exotic mounds of salt), the bouillabaisse had a light texture and was decently cooked, and the wild striped bass was meaty without being tough, and was served on a pile of French beans, braised onions, and peppery chorizo. There’s a wan little bar area designed, I suppose, to attract all the night owls prowling the lower regions of Park Avenue. The space works a little better at lunch, however, when the kitchen serves five regional tasting platters (Tuesday: Spain, Wednesday: Lebanon, etc.). There’s also a decent selection of desserts, the most successful of which seem to feature fresh fruit. I liked the lightly classic sabayon, poured over a cocktail glass filled with berries, and the figs, which are split open and doused with crushed salty pistachios, bits of fresh orange, and spoonfuls of orange-blossom cream. Best of all, though, is the restaurant’s raspberry napoleon, a delicate structure made with fresh cream and layers of lightly sugary pastry. It’s elegantly rich without being too heavy, and costs $7 exactly, which is a modest sum to pay for a safe bet. • Lunch, noon to 3 p.m. Dinner, 5 to 11:30 p.m.
• Appetizers $7 to $12; entrées $14 to $28. • All major credit cards.